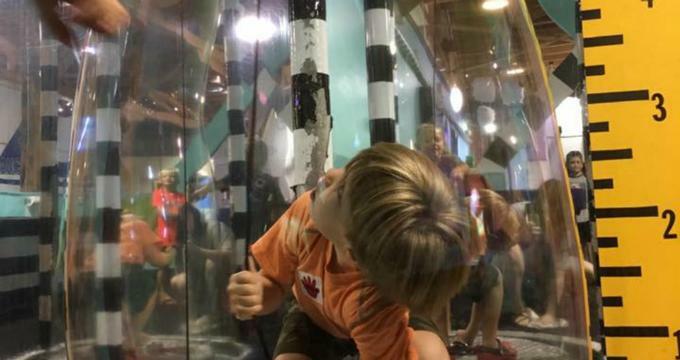 At the hands-on, interactive Northeast Louisiana Children’s Museum, kids can explore a variety of different fun exhibits. Children can pretend their working at a restaurant in the Kids’ Cafe, as well as crawl through a heart, slide down a giant microscope, and play in a pharmacy at the Discovery Hospital. Kids can also have fun driving an ambulance in the museum’s Health Hall, blow bubbles in Bubble Works, and play with a puzzle in the shape of a giant ear at The Hearing Aid exhibit. The Big Mouth exhibit teaches children about dental health, while the Reuseum teaches kids about recycling and how they can make something new out of recycled materials. The Baby Bayou exhibit area at the Northeast Louisiana Children’s Museum is designed for kids ages three and under, and is filled with age-appropriate hands-on activities. The museum also features Santa’s Christmas Village during the Christmas holiday season. The focus of the Northeast Louisiana Children’s Museum is to encourage kids to explore the wide world that surrounds them through a variety of hands-on and creative activities and play. The children’s museum also provides whimsical activities and events, offering children energetic ways to explore the world around them. Fun and learning intertwine at the museum, whether kids create giant bubbles in the bubble factory, practice being a doctor in the pretend hospital, put together a puzzle of a giant ear, or build a gingerbread house during the holiday season. The Kids’ Cafe at the Northeast Louisiana Children’s Museum is a hands-on exhibit that is sponsored by The Louisiana Restaurant Association. The exhibit creates a real-life environment of a restaurant, in which kids explore the several kinds of jobs within a restaurant business. Children can explore what it’s like to be a chef, server, or a dishwasher. The Junior League of Monroe sponsors the museum’s Bubbleworks exhibit. This bubble-filled exhibit is a space where children blow giant bubbles, measure the height of a bubble to surround themselves in, and enjoy a water table where they can race boats. The Discovery Hospital at the museum allows children a chance to pretend to be a pharmacist, nurse, or doctor, as well as crawl through a massive heart, listening to it beat. The Northeast Louisiana Children’s Museum’s Baby Bayou is a space created just for children ages three and under. This exhibit area is designed to be a brain-building space. There is also a space within the children’s museum designed for toddlers called Toddler Town, as well as a kids’ fire station complete with a fire pole. The Big Mouth exhibit was designed and constructed by local dentists. Several dentists in the area came together to carve a set of teach designed to look like a real mouth, but much larger, out of foam. The Reuseum at the Northeast Louisiana Children’s Museum invites children to use their wild imagination to create things out of recycled materials.